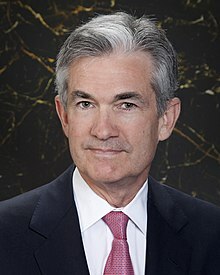 Jerome Hayden "Jay" Powell (born February 4, 1953) is the 16th and current Chair of the Federal Reserve, serving in that office since February 2018. He was nominated to the Fed Chair position by President Donald Trump, and confirmed by the United States Senate. Powell was born on February 4, 1953 in Washington, D.C., as one of six children to Patricia (née Hayden; 1926–2010) and Jerome Powell (1921–2007), a lawyer in private practice and a World War II veteran (served with United States Army 160th Field Artillery Battalion of the 45th Division in France and Germany). His maternal grandfather, James J. Hayden, was Dean of the Columbus School of Law at Catholic University of America and later a lecturer at Georgetown Law School. He has five siblings, Susan, Matthew, Tia, Libby and Monica. In 1972, Powell graduated from Georgetown Preparatory School, a Jesuit university-preparatory school. He received a Bachelor of Arts in politics from Princeton University in 1975, where his senior thesis was titled "South Africa: Forces for Change." In 1975–76, he spent a year as a legislative assistant to Pennsylvania Senator Richard Schweiker (R). Powell earned a Juris Doctor degree from Georgetown University Law Center in 1979, where he was editor-in-chief of the Georgetown Law Journal. In 1979, Powell moved to New York City and became a clerk to Judge Ellsworth Van Graafeiland of the United States Court of Appeals for the Second Circuit. From 1981 to 1983, Powell was a lawyer with Davis Polk & Wardwell, and from 1983 to 1984, he worked at the firm of Werbel & McMillen. From 1984 to 1990, Powell worked at Dillon, Read & Co., an investment bank, where he concentrated on financing, merchant banking, and mergers and acquisitions, rising to the position of vice president. Between 1990 and 1993, Powell worked in the United States Department of the Treasury, at which time Nicholas F. Brady, the former chairman of Dillon, Read & Co., was the United States Secretary of the Treasury. In 1992, Powell became the Under Secretary of the Treasury for Domestic Finance after being nominated by George H. W. Bush. During his stint at the Treasury, Powell oversaw the investigation and sanctioning of Salomon Brothers after one of its traders submitted false bids for a United States Treasury security. Powell was also involved in the negotiations that made Warren Buffett the chairman of Salomon. Between 2010 and 2012, Powell was a visiting scholar at the Bipartisan Policy Center, a think tank in Washington, D.C., where he worked on getting Congress to raise the United States debt ceiling during the United States debt-ceiling crisis of 2011. Powell presented the implications to the economy and interest rates of a default or a delay in raising the debt ceiling. He worked for a salary of $1 per year. On December 5, 2017, the Senate Banking Committee approved Powell's nomination to be Chair in a 22–1 vote, with Senator Elizabeth Warren casting the lone dissenting vote. His nomination was confirmed by the Senate on January 23, 2018 by an 84–13 vote. Powell assumed office as Chair on February 5, 2018. A survey of 30 economists in March 2017 noted that Powell was slightly more of a monetary dove than the average member of the Board of Governors. However, The Bloomberg Intelligence Fed Spectrometer rated Powell as neutral (i.e. neither a hawk nor a dove). Powell has been a skeptic of round 3 of quantitative easing, initiated in 2012, although he did vote in favor of implementation. Powell "appears to largely support" the Dodd–Frank Wall Street Reform and Consumer Protection Act, although he has stated that "we can do it more efficiently". In an October 2017 speech, Powell stated that higher capital and liquidity requirements and stress tests have made the financial system safer and must be preserved. However, he also stated that the Volcker Rule should be re-written to exclude smaller banks. In a July 2017 speech, Powell said that, in regards to Fannie Mae and Freddie Mac, the status quo is "unacceptable" and that the current situation "may feel comfortable, but it is also unsustainable". He warned that "the next few years may present our last best chance" to "address the ultimate status of Fannie Mae and Freddie Mac" and avoid "repeating the mistakes of the past". Powell expressed concerns that, in the current situation, the government is responsible for mortgage defaults and that lending standards were too rigid, noting that these can be solved by encouraging "ample amounts of private capital to support housing finance activities". In 1985, Powell married Elissa Leonard. They have three children and live in Chevy Chase Village, Maryland, where Elissa is vice chair of the board of managers of the village. In 2010, Powell was on the board of governors of Chevy Chase Club, a country club. Based on public filings, Powell's net worth is estimated to be as much as $112 million. He is the richest member of the Federal Reserve Board of Governors. Powell has served on the boards of charitable and educational institutions including DC Prep, a public charter school, the Bendheim Center for Finance at Princeton University, and The Nature Conservancy. He was also a founder of the Center City Consortium, a group of 16 parochial schools in the poorest areas of Washington, D.C.
Powell is a registered Republican. ^ a b c Applebaum, Binyamin (December 27, 2011). "Obama to Nominate Two for Vacancies on Fed Board". The New York Times. ^ a b c Long, Heather (October 31, 2017). "Jerome Powell, Trump's pick to lead Fed, would be the richest chair since the 1940s". The Washington Post. ^ a b Gandel, Stephen (November 2, 2017). "Powell Is Trump's Kind of Rich". Bloomberg L.P.
^ NPR. "Senate Confirms Jerome Powell As New Federal Reserve Chair". Retrieved January 31, 2018. ^ The Hill. "Senate confirms Jerome Powell as Fed chairman". Retrieved January 31, 2018. The Federal Reserve. "Federal Open Market Committee unanimously selects Jerome H. Powell to serve as its Chairman, effective February 3, 2018". Retrieved February 2, 2018. ^ a b "Jerome Powell Notice". Legacy. ^ a b "ELISSA LEONARD WED TO JEROME H. POWELL". The New York Times. September 15, 1985. ^ "Patricia H. Powell's Obituary on The Washington Post". The Washington Post. October 1, 2010. ^ a b "Nomination of Jerome H. Powell To Be an Under Secretary of the Treasury". University of California, Santa Barbara (Press release). April 9, 1992. ^ a b c d Greenhouse, Steven (April 14, 1992). "New Duties Familiar To Treasury Nominee". The New York Times. ^ a b c "Board Members: Jerome H. Powell". Federal Reserve Board of Governors. ^ a b c "Banker Joins Dillon, Read". The New York Times. February 17, 1995. ^ Powell, Jerome (October 5, 2017). "Treasury Markets and the TMPG". Federal Reserve Board of Governors. ^ Loomis, Carol J. (October 27, 1997). "Warren Buffett's Wild Ride at Salomon". Fortune. ^ a b c "Bipartisan Policy Center: Jerome Powell". Bipartisan Policy Center. ^ a b "GEF Adds to Investment Team" (Press release). Business Wire. July 8, 2008. ^ "PN1350 — Jerome H. Powell — Federal Reserve System". United States Senate. ^ Robb, Greg (March 4, 2013). "Fed's Powell: Ending too big to fail to take years". MarketWatch. ^ Borak, Donna (April 7, 2017). "Fed taps Jerome Powell to head oversight of 'too big to fail' banks". CNNMoney. ^ "Senate panel OKs Trump's pick, Jerome Powell, for the next Federal Reserve chief". Los Angeles Times. December 5, 2017. Retrieved December 6, 2017. ^ a b c Matthews, Steve (November 1, 2017). "Here's What You Need to Know About Powell's Fed Chair Selection". Bloomberg L.P.
^ Klein, Matthew C. (July 7, 2017). "Jerome Powell has some curious ideas about housing finance". Financial Times. ^ "Chevy Chase Village: Staff Directory". Chevy Chase Village, Maryland. 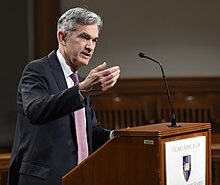 Wikimedia Commons has media related to Jerome Powell. This page was last edited on 16 April 2019, at 02:27 (UTC).